While they might have been enemies in real life, in a twist of fate, Tsar Nicholas II and the Bolshevik leader of 1917 October revolution, Vladimir Lenin, have been sharing one canvas for almost a century. 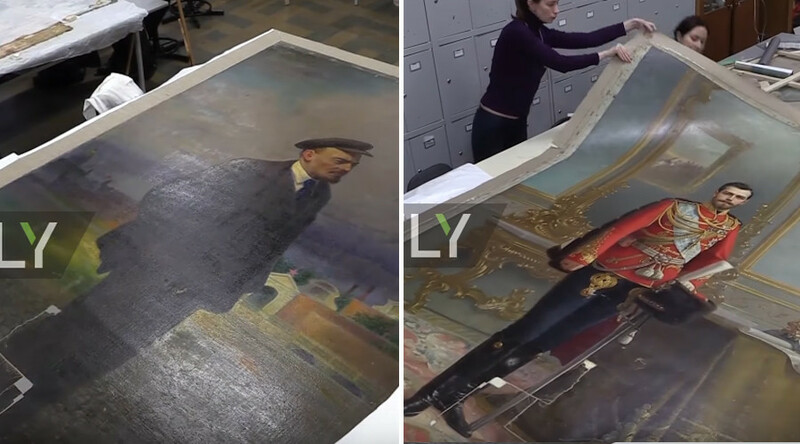 The secret double nature of the painting was discovered by pure chance during restoration works at the St. Petersburg’s Stieglitz Art and Industry Academy. The full-length Lenin portrait was commissioned in 1924, the year Lenin died, to the Soviet artist Vladislav Izmailovich, who is believed to have been ordered to cover politically inappropriate image with Lenin. However, the artist apparently decided there’s a room for both revolutionary hero and monarch on the canvas, painting the Lenin portrait on the reverse side while at the same time masking the image of Nicholas II from inquisitive eye beneath layers of washable paint. "The artist [Vladislav Izmailovich] who painted Lenin was a very good artist. Even then he understood that times were changing and so he used washable paints and painted several layers and in so doing saved a beautiful portrait of Nicholas II. He clearly understood that he was risking his life for it, because in those times if somebody, spotted him whilst he was doing it and didn't trust him he would be shot," Vasily Kichedzhi, Rector at Stieglitz Art and Industry Academy, told RT’s Ruptly video agency. The unveiled Nicholas II’s portrait was commissioned in 1896 to Russian artist Ilya Galkin to mark the year of the last Russian Emperor’s ascension to the throne. Before renovation the two-side artwork had been kept in a city school for almost 70 years. According to an Academy representative, the Lenin painting was damaged in the 70s but only put to restoration in 2013. The stunning discovery was made after X-ray scan showed a second face right next to Lenin’s. The director of the school museum, Svetlana Pasynkova has recalled, that in 2013, when Romanov Imperial House celebrated its 300th anniversary, some of the school’s graduates suddenly recounted that they saw a man’s high boot where a piece of the painting had been ripped off. That was a first step on the road to the eventual revelation, as Lenin was portrayed in shoes. Upon conclusion of restoration works, the painting will be put on public display as one piece in the Academy building from November 27. “We cannot go against history and separate the paintings,” Acedemy representative explained the decision speaking to RIA Novosti.